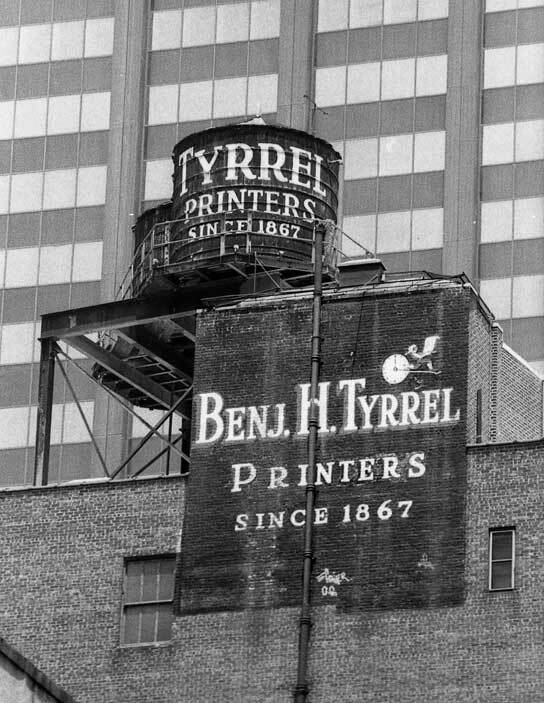 The sign says SINCE 1867, but the origins of Benjamin H. Tyrrel go back a few years earlier. In the Trow New York City Directory for 1863, for instance, we find, "Tyrrel Benjamin H. successor to Tyrrel & Brother, Carpenter & Builder, Stores and Offices Fitted Up, Jobbing Promptly Attended To, 477 Broome, h 184 Amity." Tyrrel & Brother were William and Daniel Tyrrel, carpenters and builders in New York in mid-19th century. Benjamin Tyrrel may have been their successor, but he did not long remain a carpenter and builder. By the following year, 1864, Trow listed him as "Tyrrell [sic] Benjamin H. printer, h 5 Abingdon sq." 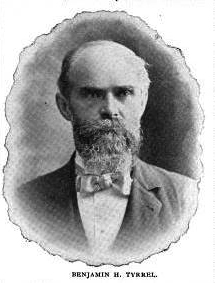 Benjamin Harvey Tyrrel (1839-1908) was born 18 November 1839 in Ellenville, N.Y., and died 9 December 1908 in Brooklyn, NY. In the 1890s Tyrrel twice filed passport applications where he gave his birthdate as 18 Nov. 1840. There is also a discrepancy in his age at death. A notice in the New York Times, 14 Dec. 1908, says, "aged 70," while certificate 22606 in Ancestry.com's New York Death Index, reads, "Benjamin H Tyrrel age 69 died 9 Dec 1908 Kings, New York, USA." If he was born in November and died 8 Dec. 1908, age 69, then he was born 1839. This portrait appeared in the New England Stationer and Printer, Nov. 1899. The Reference Book and Directory of the Book and Job Printers, J. Arthur Murphy & Co., 111 Nassau Street, 1871-2, listed Tyrrel as, "Tyrrel Benjamin H., 74 Maiden lane. Book and job printing. Has five Gordon presses." By 1909 Tyrrel had long since developed their specialty of printing for the legal profession. This ad appeared in the New York Charities Directory, compiled by H. R. Hurd. 11th edition, 1909. In 1912 The New York State Dept. of Labor's Register of Factories recorded Benjamin H. Tyrrel at 206-208 Fulton St. with a work force of 50 employees, 41 men in the shop, 5 women in the shop and an office staff of 4. Another Tyrrel ad appeared in Bender's Lawyer's Diary in 1920. Tyrrel's address in these ads is 206-208 Fulton St., which was their location from 1904 to 1928. In 1928 Tyrell built their own building at 110 Greenwich St. on the southwest corner of Carlisle St. As reported in the New York Times, 28 March 1928, "Benjamin H. Tyrrel, Inc., printer, has purchased from the Gilboa Realty Corporation, Benjamin Benenson President, the buildings at the southwest corner of Greenwich and Carlisle Streets, comprising a plot of 6,000 square feet, known as 110-112 Greenwich Street. The purchaser will erect a new building with stores and loft space from plans prepared by William Higginson. He will occupy the two top floors for his printing business, which has been established for many years at 206-8 Fulton Street. ..."
Following Benjamin H. Tyrrel's death in 1908, direction of the company was taken over by three sons, Elmer B. Tyrrel (1869-1947), Benjamin Lester Tyrrel (1871-1955), and Samuel B. Tyrrel (1882-1926). Samuel B. Tyrrel was born Jan. 1882 in Brooklyn, N. Y. and died in 1926. This short notice appeared in the New York Times, 6 Nov. 1926, "Tyrrel - After a short illness at Brooklyn, N. Y., Samuel B. Tyrrel. Funeral services at 677 East 19th St., Brooklyn, on Sunday, Nov. 7, at 3 o'clock. Interment Poughkeepsie on Monday. Poughkeepsie and New Jersey papers please copy." Elmer B. Tyrrel was born 24 May 1869 in Brooklyn, N. Y. and died 21 April 1947. The following obituary appeared in the New York Times, 23 April 1947, "Elmer B. Tyrrel, president since 1908 of Benj. H. Tyrrel, 110 Greenwich Street, a printing firm specializing in legal and financial work which was founded in 1867 by his father, died of a heart attack on Monday in Vassar Hospital, Poughkeepsie, N. Y., according to word received here yesterday. Mr. Tyrrel had been rushed to the hospital from his country home in Millbrook, N. Y. He had a city home at 677 East Nineteenth Street, Brooklyn. His age was 77." Benjamin Lester Tyrrel was born 3 Jan 1872 in Brooklyn and died in 1955. Only a brief death notice appeared in the New York Times, 18 April 1955, reading, "Tyrrel - B. Lester, suddenly at his residence on Jackson St., New Suffolk, L. I., on April 17, beloved husband of Nellie, devoted father of R. Tryon Tyrrel and Mrs. Marie T. Given. Reposing at the Rogers Funeral Home, Main Road, Cutchogue, L. I. Funeral services on Wednesday, April 20, at 2 P. M."
Third generation Tyrells in the business were B. Lester Tyrrel's son, Ralph Tryon Tyrrel (1895-1957), and Randolph Elmer Tyrrel (1898-1963), Elmer B. Tyrrel's son. Find A Grave has photos of the Tyrrel monument in Crum Elbow Rural Cemetery, Hyde Park, N. Y., as well as Elmer B. Tyrrel's gravestone. Other Tyrells include Randolph E. Tyrrel.